An overpayment of unemployment benefits occurs when you receive unemployment compensation you were not eligible for. What happens if you receive a notice that you have been overpaid, and what can you do? You could have been overpaid because of an error or because you claimed benefits you were not entitled to receive. Or your former employer could have successfully contested your unemployment claim, and the state could have determined that you were therefore not eligible for benefits. Here’s information on unemployment benefit disqualifications. In most cases you will be required to repay the unemployment compensation that was overpaid. Your state unemployment office will notify you (typically by mail) if you have been overpaid. 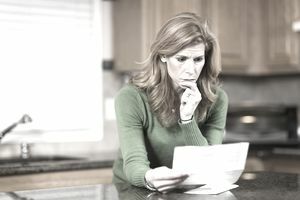 The notice will explain the reason you are getting the overpayment notice, how much you owe, penalties (if applicable), information on how to appeal, and instructions on repaying the amount you have been overpaid. How It the Overpayment Repaid? In most cases you will be asked to repay the overpayment. You may be asked to send a check for the balance of the overpayment. If you can't repay it all once, you may be able to negotiate a payment plan. Otherwise, if you are entitled to further benefits, you may be able to use those benefits to repay the overpayment. If you have not made an adequate arrangement for repayment, then the money that you owe may be seized from your paycheck if you are working, lottery winnings or tax refunds. If the overpayment was because of fraud, you might be charged a penalty and possibly charged with criminal fraud. Also, you may be banned from collecting future unemployment benefits. If you believe the notice is not accurate, you can appeal the decision. If you were overpaid because of an error, you might be able to ask for a waiver to avoid repaying all or some of the amount of benefits you received by mistake. In most cases, you will have to prove financial hardship to receive a waiver or to negotiate a payment plan. In most states you will be entitled to a hearing to consider your appeal. A hearing is an informal proceeding held before an administrative law judge. Based on the evidence presented at the hearing, the judge will decide whether you are entitled to - or eligible for - unemployment insurance benefits. At the hearing, you, your employer and any witnesses for either side, may testify. The testimony will be recorded. Either side can also present papers or other physical evidence. Instructions on how to appeal will be listed on your state unemployment website. You may be able to file an appeal online, by fax, by mail, in-person or by phone. Here's more on how to file an unemployment benefits appeal. These contain general and state-specific information on unemployment overpayment, unemployment compensation and benefits. Contact your state unemployment office for a determination of your specific circumstances and clarification about how overpayment is handled your state. Remember that state laws vary.